After spending Bastille day sampling Laduree’s new dessert offerings for afternoon tea two weeks ago, I went home totally inspired to create my own Ispahan Macaron Cake. 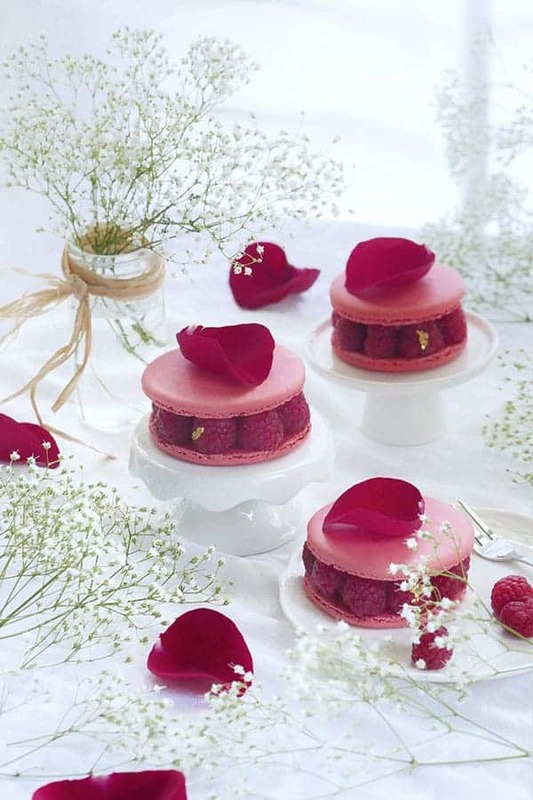 Even if you’ve never tasted the Ispahan, made famous by Laduree and Pierre Herme, I’m sure you will recognize the sight of this iconic Parisian dessert – composed of a big macaron cake filled with rose petal cream and lychees, and decorated with fresh raspberries. It is a delicious constrast between refreshing and rich at the same time. This new macaron recipe is inspired by the flavours of the Ispahan, it consists of both a rose buttercream and a lychee cream made from white chocolate. Instead of just embedding a piece of the fresh lychee flesh into the cake, I wanted to bring that fruit flavour forward by making a lychee cream with it too. With the addition of the fresh juicy raspberries, it’s just the perfect combination between fragrant, sweet and tangy. 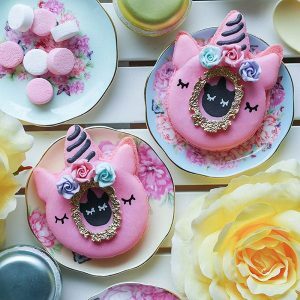 Even those who usually find macarons too sweet will really enjoy this one. Wash raspberries thoroughly and gently pat dry with paper towel. Allow it to dry completely on the paper towel before assembly. Special care must be taken to dry the raspberries in order to prevent adding any excess moisture onto the macaron shells. Because of the higher moisture that fruit adds to macaron shells, the Ispahan macaron cakes are best eaten between 12-24 hours after assembly. 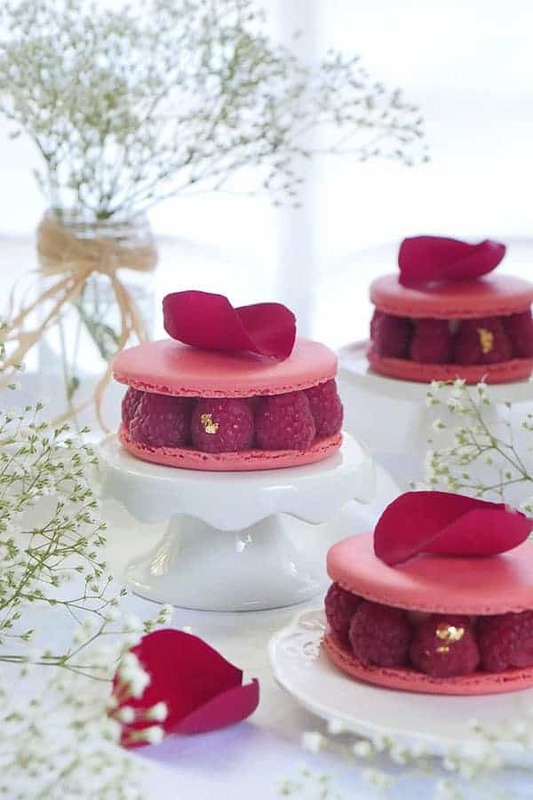 A beautiful raspberry pink macaron cake inspired by the iconic "Ispahan" dessert made famous by Laduree and Pierre Herme. Inside, it is filled with a fragrant rose buttercream, lychee cream, and fresh lychee and raspberries. Absolutely perfect for a Parisian afternoon tea party. 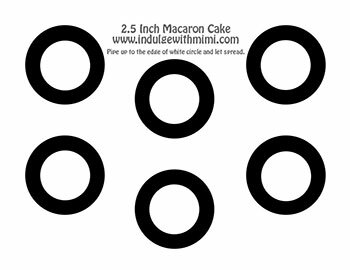 Print out the big macaron template provided in post. Pulse almond flour and powdered sugar together in a food processor. Sift dry ingredients. Discard big pieces of almond that can't be sifted. Transfer batter into a piping bag fitted with a #6 round piping tip. On parchment paper or silicone mats, pipe the big macaron cake shape. Wait until the shells become completely dry before baking. 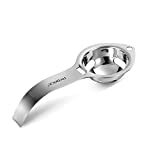 This is a critical step to prevent cracking of the big macaron shell. Resting time for big macaron shells will take longer than regular sized macarons. READ: TIPS ON BAKING BIG MACARON SHELLS. Bake at 325F for 25-35 minutes. Every oven is different, you may need to adjust your own temperature settings. 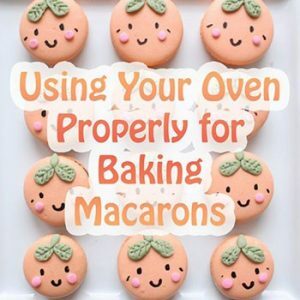 Please read How to Use Your Home Oven Properly for Baking Macarons if you are unsure. Open canned lychees. Discard syrup. Set aside 3 whole lychees for use later in the macaron assembly. Pulse the rest of the whole lychees in food processor until it becomes a fine puree. Pour puree through a strainer to separate the pulp and juice. Keep 90 ml of the juice for use in this recipe. With a spoon, push out as much liquid out of the pulp as possible. Discard pulp. Chop up white chocolate into small pieces. In a small bowl, whisk together 1 tbsp of lychee juice and corn starch until no visible lumps can be seen. Heat remaining juice and sugar on med-high heat until sugar fully dissolves. Take off heat before it comes to a full boil. Pour a little bit of the hot juice into the corn starch mixture while whisking vigorously. Take this mixture and pour it back into the pot of hot lychee juice while whisking vigorously. Place pot back onto the stove on low-medium heat. It will thicken up considerably within 30 seconds to 1 minute. Take off heat. Pour onto the chopped white chocolate. Wait one minute. Mix well with a spatula until all the chocolate has melted. Add butter and mix together until incorporated. Pour into blender and blend on high for 1 minute. Place in the fridge to set before putting in piping bag. The mixture might look curdled or separated for a while but keep mixing. It will all come together to become a smooth and fluffy buttercream. Add rose water and rose essence and beat until incorporated. Wash raspberries thoroughly and gently pat dry with paper towel. 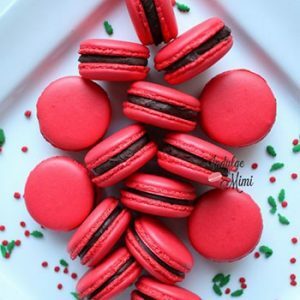 Find two similar sized macaron shells to make a pair. Starting 1 cm away from the edge of the shell, pipe a ring of rose buttercream as a dam then fill it with a small dab of lychee cream. Spread the cream out evenly so that it creates a "barrier" between the shell and the lychee flesh which is to be added next. Pat dry whole lychees with paper towel and split into halves. Add lychee flesh inside the dam and top off with more lychee cream. Add raspberries around the mound of buttercream. Let it touch the cream slightly to help keep it in place. Pipe more rose buttercream into the dam until it reaches the height of the raspberries. Assemble remaining macaron shell on top. 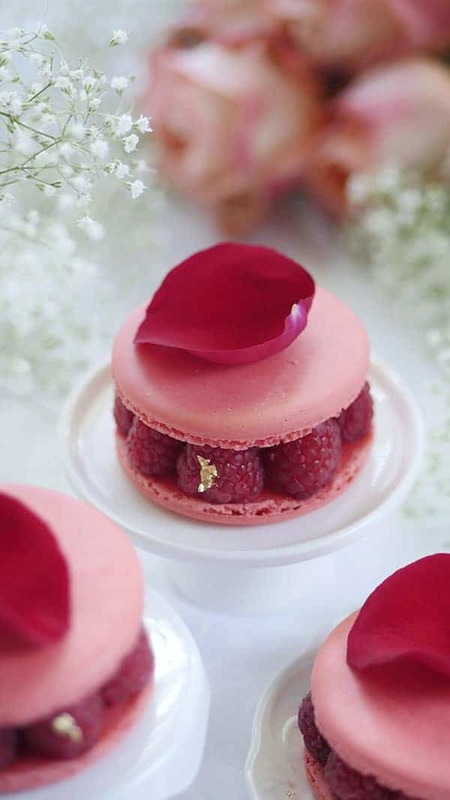 Top off with an edible red rose petal and add 24K gold leaf if desired. 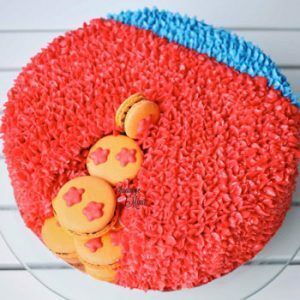 Let the macaron cake mature for 6 to 12 hours before eating. (Best eaten within 24 hours.) Enjoy! * Aged egg whites were weighed before aging. * Organic raspberries are preferable over conventional as they are part of the "Dirty Dozen" fruits/vegetables. * This temperature is generally accepted to be able to kill salmonella in eggs. However, always take caution when serving to those with compromised immune systems. 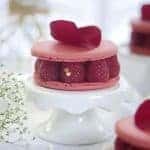 This macaron template makes six macarons according to the recipe above and utilizes approximately 8 fresh raspberries for decoration. This template and many more is free for my newsletter subscribers. Please sign up to have the password to the member’s only area sent to you via email. 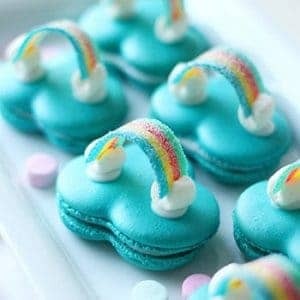 Hi, Mimi – I have a quick question for you, when piping larger mac shells such as these, do you start from the outside or center?